The best place to go in Golden Week for a drinking party is Maruyama Park in Sapporo Japan. Here you will see one of the many Japanese temples and if you are lucky, a Japanese wedding. 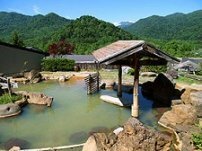 Maruyama-koen is located in the western suburbs of Sapporo right next to Maruyama hill which is 226 meters above sea level. This huge 60,000-square meter area contains many kinds of trees including oak, magnolia, cherry, maple and more. 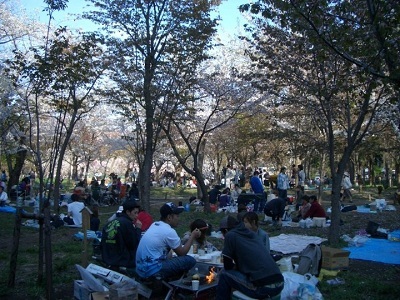 The park is filled with people coming to view the 1,700 cherry blossom (hanami) trees and you will see many drinking parties, barbecues and games being played until late at night. This allocated week can sometimes be a little too cold for the cherry blossoms to be blooming so it is also possible to see them and have barbecues after Golden Week, until the middle of May. After this time barbecues are prohibited for the rest of the year. Boo! It is especially a great time to meet some of the locals and they will always be happy to have a drink or play some football with you, so don't be shy! For the most beautiful spots, head straight up the path, past the playing ground on your right and up the stairs. Here you will find the most beautiful cheery trees in the park and the perfect place to have your drinking party. The petals fall around you just like in the old samurai movies. May 5th - Children's Day. Because of the many public holidays at the end of April and beginning of May, many leisure industries experience an increase in business. The film industry noticed this change and acted upon it.In 1951 the film Jiyuu Gakkou sold the most tickets since its release during.After, the managing director of Daiei Films came up with the name 'Golden Week' based upon the Japanese radio phrase 'Golden Time' which is when the listener ratings are at its highest. Maruyama hill is situated right by the side of the park and has a spectacular view of the city from the summit. The hike up (more like a tough walk) takes only about 30 minutes and very easy even for someone who doesn't hike, like me. I have even seen someone in heels do it, I kid you not! You can also find Maruyama Zoo very close to the park. It contains about 200 species of living things. In winter the zoo is covered in snow, and you can see giraffes and lions walking around in the middle of this snowy ground providing an unusual and beautiful scene that you will rarely see anywhere else. Hokkaido Shrine can also be found at the end of the park by following the signs. Take the Tozai subway Line (Orange)bound for Miyanosawa to Maruyama Koen Station. Approximately 5 mins from Odori subway station and costs 200 yen one way. From Maruyama Koen Station its about a 5 minute walk. Open 24 hours. Free admission.